Even though Windows 7 is a beta, which means there are a lot of bugs still present—some of which have angered us quite a bit during our time testing the OS. The good news is there are actually some things you can do on your own to avoid them or prevent other nastiness from occurring. There's actually a tool, in Control Panel, called Troubleshooting. Open it up and you'll see various options like configuring devices, connecting to a network and checking to make sure your sound card works correctly. We won't go through each individual options here, but it's a very good place to start when you've hit a problem, before you turn to Googling. This doesn't work 100%, but if you type "Program Compatibility" into the search bar in the Start menu, you'll find a compatibility wizard that helps make older apps work with Windows 7. (Sometimes, you can get to it by right-clicking an application that is having trouble launching.) Once you find your app—which may take a little bit of disk browsing if it's not displaying under the list—you'll choose one of potential issues and which version of Windows it previously worked for. In at least one case, we found that running through this made a non-starting app start up under Win 7, so it's good to know about. And if you're having any sort of problems with Windows 7 you need a tech-savvy friend or family member to walk you through, try the problem steps recorder. It's an app built into Windows 7 that, when activated, records the button presses and mouse clicks you make in order to generate an HTML-based report of the steps you took to cause a problem. Sending this to your friend who also has Windows 7 will let him diagnose where you've screwed up, so you can STOP DOING THAT. If you feel Windows 7 is running slower than it should, take a look at the Windows Experience Index. With those scores you can tell whether it's your RAM that's making your machine chunk, or your graphics card, or your slow hard drive. Then, replace each part as necessary. reg delete HKLM\SOFTWARE\Microsoft\SQMClient\Windows\DisabledSessions /va /f and press enter. UAC may be decent enough in warning and protecting you of intrusions, but it can also get in the way. One bug in the beta actually turns off your desktop Gadgets if you disable UAC. Here's how you re-enable it. 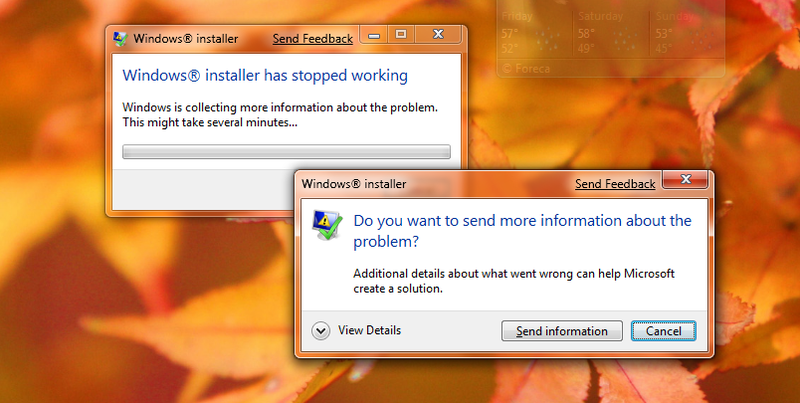 Although Windows 7 is at least as secure as Vista, you're still going to want to install antivirus software on it. The easiest Win 7-compatible one we like is AVG, which runs just fine, protects decently enough and is free. It doesn't look like sleep mode has been optimized for all the millions of types of hardware configurations out there now—it is a beta after all. We'd suggest turning it off entirely instead of trying to find out whether or not your machine supports sleep/hibernate 100%. If you don't, you'll have to wake your machine up the hard way. SetteMaxer is a utility that's able to to tweak a few settings not easily accessible to the normal user, like disabling auto-reboot on a crash, disabling Windows Defender or disabling UAC. If you don't know what you're doing, you shouldn't tinker. Unlike in Vista, there's no warning message when the User Account Control is changed. Someone made a proof-of-concept that exploits this into switching your UAC off and taking control of your machine. There's no workaround for this one unless you raise UAC to MAXIMUM (which is annoying), so be careful.